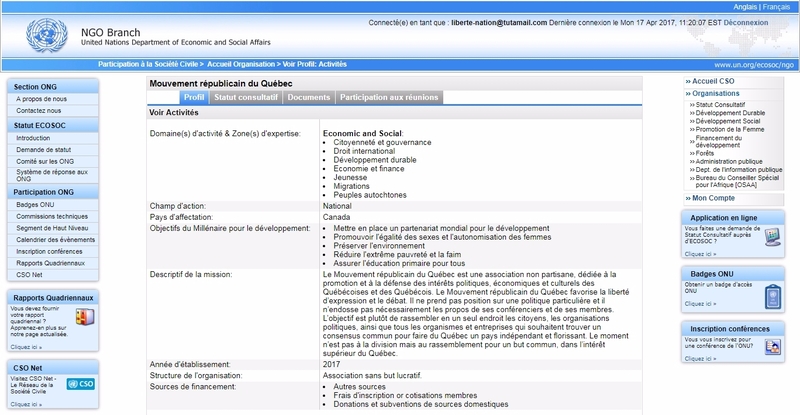 The Republican Movement of Quebec is officially registered on the website of the United Nations Department of Economic and Social Affairs (DESA) with non-advisory status, in the following areas of activity: citizenship and governance, international law, sustainable development, youth, economy and finance, migration, indigenous peoples. The description of its mission is: The Republican Movement of Quebec is a free association of men and women, of common law and customary law. Non-partisan, the public interest study group is dedicated in promoting and defending the political, economical and cultural interests of Quebeckers. It promotes freedom of expression and debate. It does not take a stand on a particular policy until some form of convergence is established between all its members. The goal is to bring together citizens, political organizations and all the organizations and businesses that want to find a common consensus in order to make Quebec an independent and flourishing country. The time is not for division but for a common purpose, in the best interest of Quebec. The Republican Movement of Quebec will be able to share its profile with more than 24,000 CSOs, specifying its field of activity, the scope of its work and its involvement in development issues, including sustainable development, social development and cultural development. In a few years, the Republican Movement of Quebec will be able to apply for consultative status with the Economic and Social Council. Once accredited, the organization will be able to attend international conferences convened by the United Nations, as well as, preparatory meetings for such conferences. « Non-governmental organization » : www.esango.un.org. Whether by supporting policy-making bodies, facilitating major UN conferences, projecting trends in demography, publishing top quality economic analysis, or helping countries develop national capacity, UN DESA’s influence has reached far beyond the doors of the UN. Our vision for human progress goes beyond promoting global agreements and is fundamentally about action. We are committed to addressing the world’s most pressing concerns and taking the necessary steps to help create a better world for all – a world that is inclusive, prosperous and sustainable. By facilitating major global conferences and summits, as mandated by UN Member States, UN DESA assists countries as they find common ground and take decisive steps forward. Specifically, UN DESA is tasked with supporting deliberations in two major UN charter bodies: the UN General Assembly and UN Economic and Social Council (ECOSOC), including ECOSOC’s subsidiary bodies. In addition, UN DESA organises and supports consultations with a range of stakeholders, including the private sector and civil society. In this regard, UN DESA’s main priorities are promoting progress toward and strengthening accountability in achieving the SDGs. Furthermore, UN DESA is responsible for ensuring civil society engagement with the UN through the ECOSOC bodies. UN DESA, generates, analyzes and compiles a wide range of official economic, social and environmental data and information on which Member States draw to review common problems and to take stock of policy options. One of the Department’s primary contributions is providing policy research and analysis for governments to use in their deliberations and decision-making. Throughout recent decades, UN DESA’s in-depth policy analysis has helped resolve many of the world’s most pressing socio-economic issues. UN DESA is also the lead “author” Department of the UN Secretariat. Our research and analytical work covers a range of economic, social and environmental issues. We produce a host of flagship publications and major intergovernmental reports, which are essential to UN negotiations and global policy decisions. Each year, UN DESA’s many publications are distributed in print and electronic formats around the world. The Department is also known for its first-rate data, including population estimates and statistics, long considered global benchmarks of reliable information. UN DESA also advises Member States / Governments on implementing the policies and programmes developed at UN conferences back in their home countries. It assists interested Governments in translating policy frameworks developed in UN conferences and summits into programmes at the country level and, through technical assistance, helps build national capacities.